This sea mark was erected by Robert, Earl of Warwick, Admiral of the seas - Captain Richard Blith Sen. his captain in the Prince Royal and W. Cooke, master of attendant his master. A coat of arms was placed below the inscription. There is no record of an inscription on the Kickergill. This inscription seems to date the Gillkicker to before 1658 as Robert Rich, Earl of Warwick lived I587-I658. 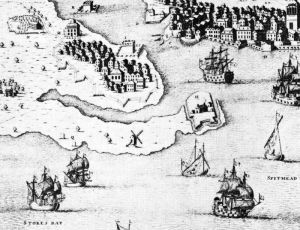 1643 is the only year that Robert, Earl of Warwick commanded the same ship ' Prince Royal' on which Blith Senior appears as Captain. 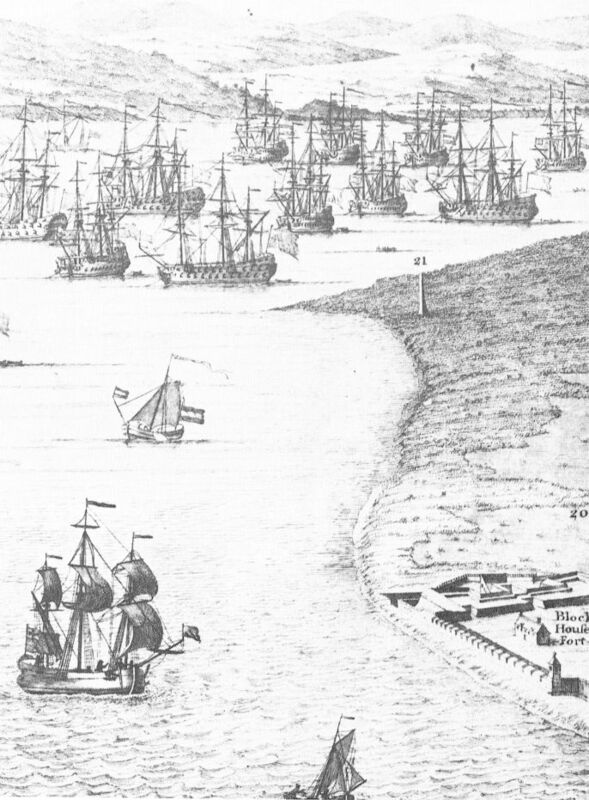 The earlier date seems to be confirmed as in June 1690 Thomas Wilshaw, resident commissioner at Portsmouth, informed the Navy Board that there had been complaints that the Gilkicker had 'grown dark and dull... it not having been refreshed these 40 years as Sir John Tippets (Surveyor of the Navy) believes'. 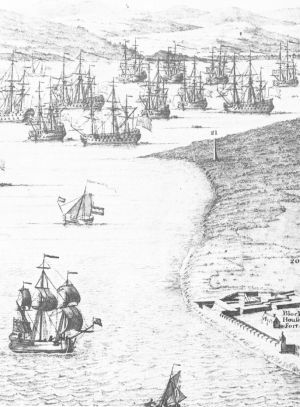 Tippets reports that the Gilkicker had been 'refreshed by directions of the Committee of Parliament .. for affairs of the Admiralty and Navy. 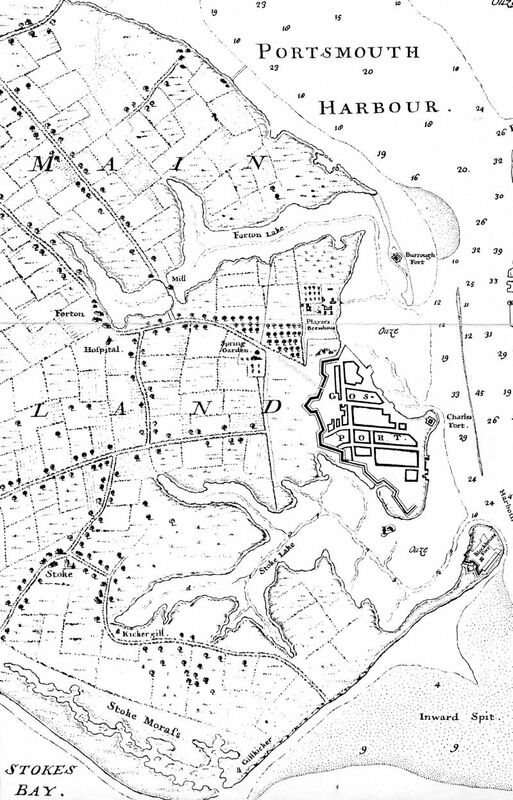 Gilkicker Tower 1729 Section of map circa 1711 with sea marks at Q. 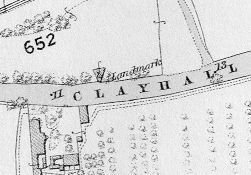 The origins of the names are obscure but the point at 'Hasilworth' seems to have changed to Gilkicker Point after the erection of these marks. Daniel Defoe, writing in 1724 mentions "...the point of land on the side of Gosport which they call Gilkicker and where also they have two batteries". 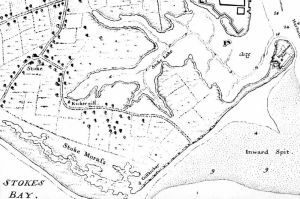 Did Gilkicker Point gain its name from the sea mark or was it the other way round? Slight refers to 'Near the point of land called the Kicker..' Could it have been boot shaped? There is no certain explanation why the seamarks in England were called Gill-Kicker and Kicker-Gill. However, a possible answer lies in the etymology of the words gill and kicker. 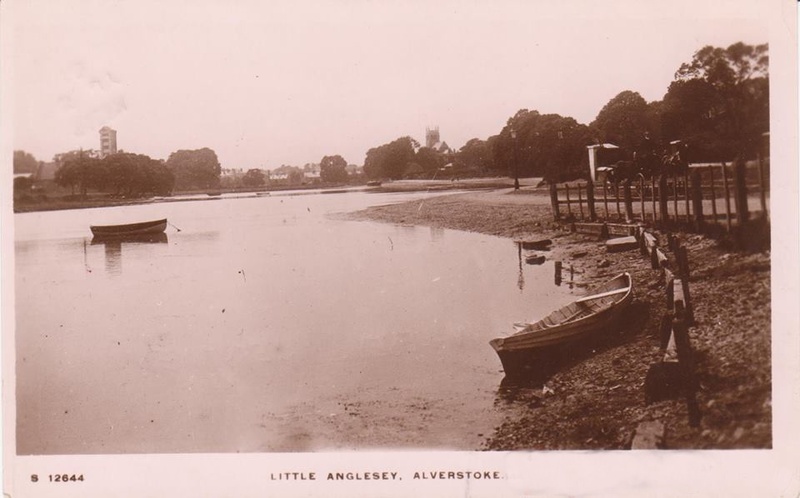 The place-name “gill” means a stream or small wooded glen, and Gill-Kicker, the first seamark to be constructed, was backed by a marshy creek (now dammed and known as Gilkicker Lake), while Kicker-Gill stood above a wooded slope by Alverstoke creek (now Stoke Lake). The surname “Kicker” derives from the Middle English word “kiken”, meaning “to watch or spy” (Reaney & Wilson 2006). 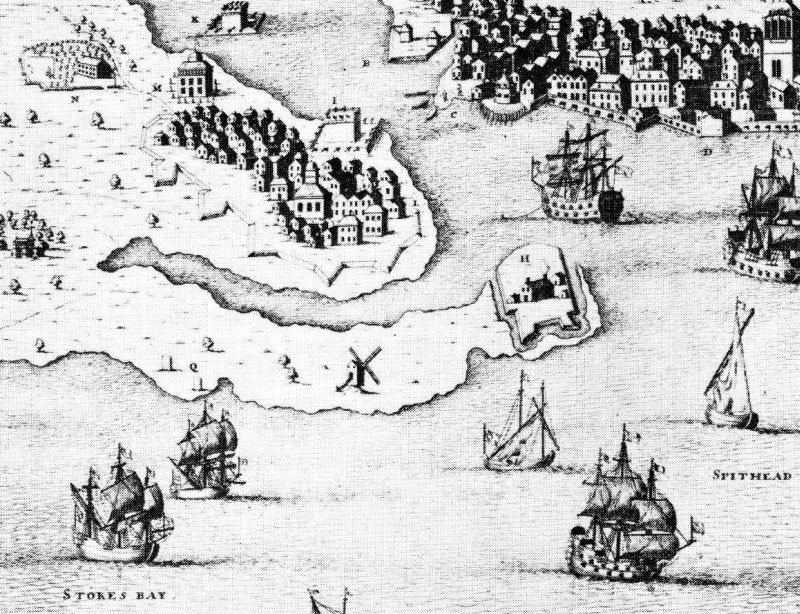 From the same root come English and Scots dialect “keeker” and Dutch “kijker”, all meaning “watcher” and from which the 17th-century application of the word Kicker to the seamarks could have derived. In a sense they were “watching” (facing) the sea, were “watching over” sailors (assisting in safe navigation) and were themselves objects that sailors “watched for”. In architectural terms a 'kicker' is a stub or foundation of a column on which the latter sits. A gill is 'a small ravine, a wooded glen, a brook. (Old Norse = Gil)'. 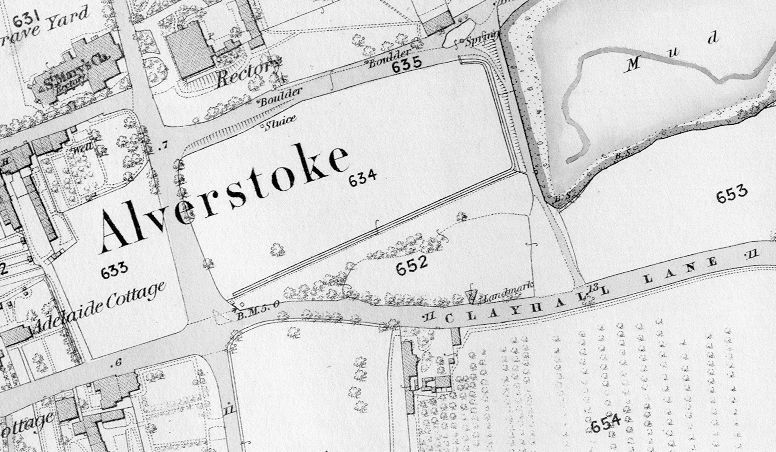 So perhaps the 'Gill Kicker' was so named because of its type of construction and location, close to the valley of the River Alver, with its partner merely a reversal of the name. 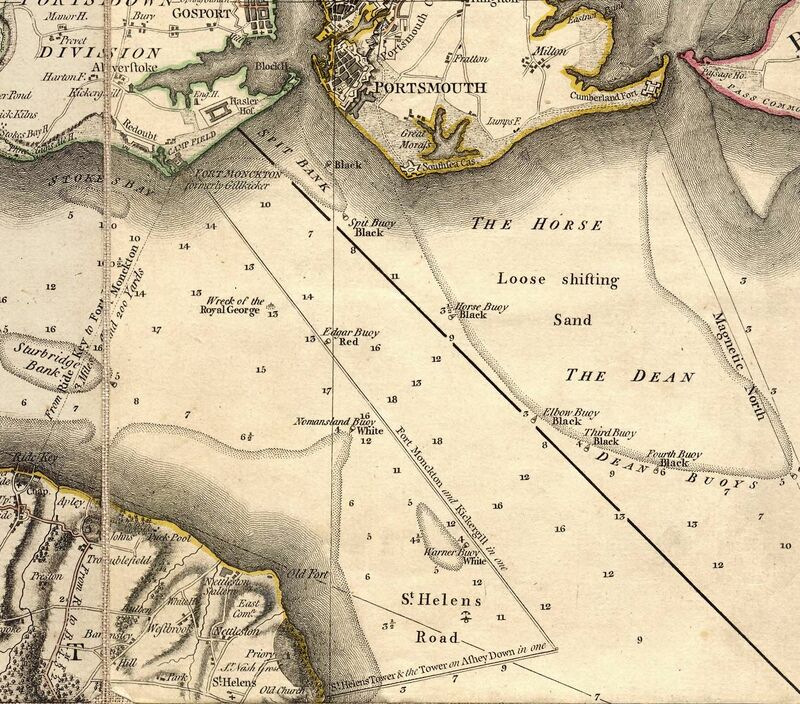 explains how the two sea marks were used to sail into Spithead and into Portsmouth Harbour. 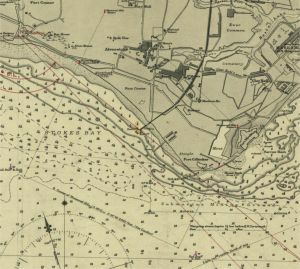 Keep Sandown [Fort] touching with Culver [Cliffe] to clear you of Bembridge Ledge, until the Kickers are in one, and, Ashedown mark touching, you have 3 Fathom Water, then keeping those marks on until Bembridge Point and Dun Nose is in one you'll have 7 Fathom. then the mark kept on you'll have from Do. 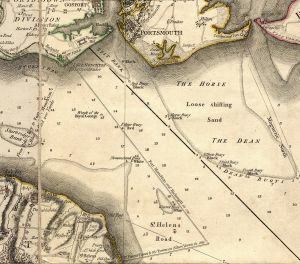 to 9, 12, 15, 18 Fathom a Mile to the Eastward of the Warner Buoy, the which will near continue until the Chalkhole upon Post-down be on South Sea Castle. 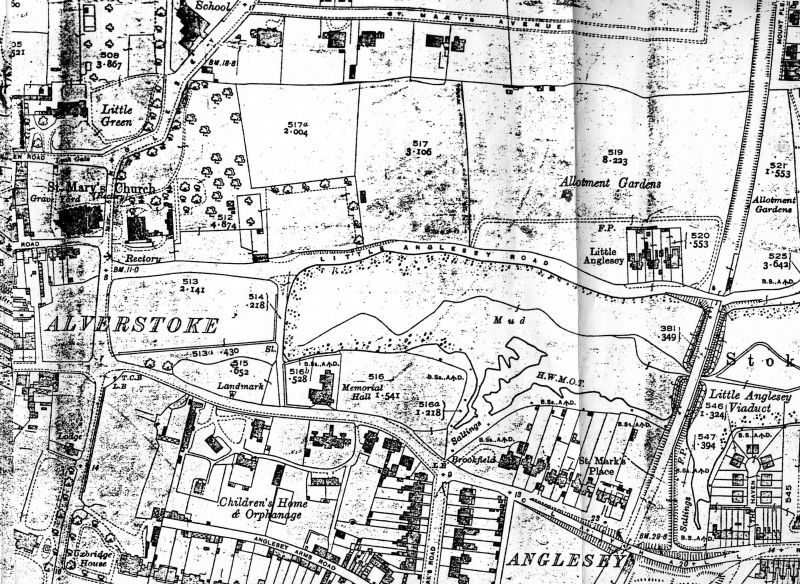 which kept on until the Castle near Gosport be on Blockhouse Point the mark to run into the Harbour. You may Anchor at Spit Head in about 12 or 14 Fathom the Kicker being about 1/4 Mile distant bearing N.W. 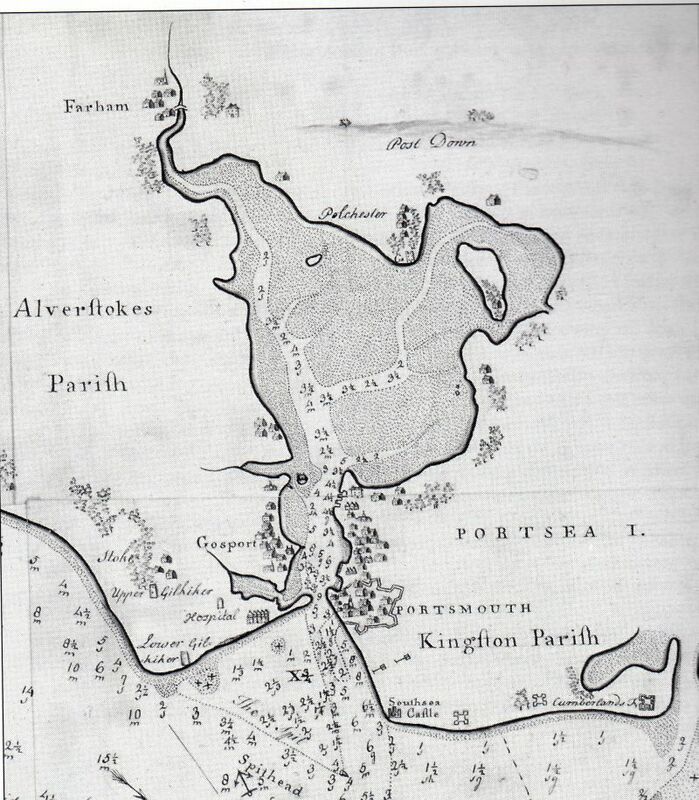 Taylor's map of 1759 showing the two sea marks. 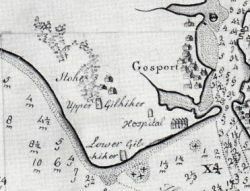 A map of 1766 which refers to the sea marks as Upper and Lower 'Gilkiker'. Both marks were triangular in plan and were constructed as columns of stone. They were heightened in the 1800s with the addition of a brick topping. 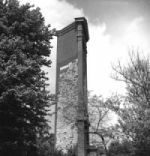 ...Gilkicker tower built in 1669 and heightened in the C18, the original part in stone, the later additions in brick ending in an oddly placed pediment brought out in several delicate orders of moulding. The intermediate part was a most attractive medley of dark red brick and silver stone. The tower was wantonly destroyed in 1965. 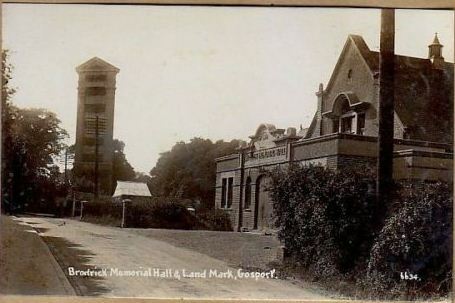 The site of the Kickergill tower in 2009 with the Brodrick Memorial Hall. 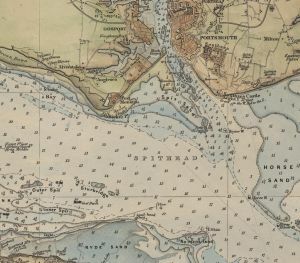 An Admiralty chart of 1890 indicates that the Kickergill was constructed with bands of red and white. In modern times this led to some locals refering to the monumnet as 'bread and jam'. 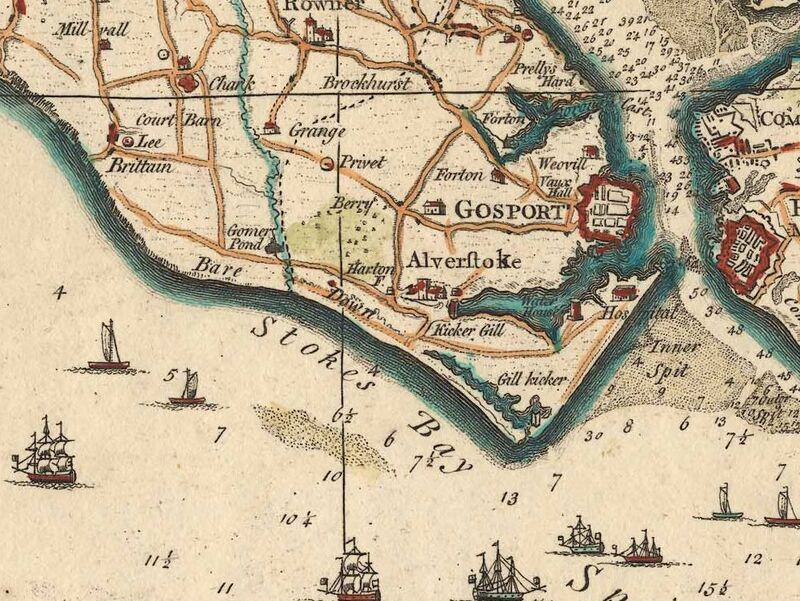 The Gilkicker was removed when Fort Monckton was constructed under the recommendations of an engineer, John Archer, who was tasked with reporting on the strength of the Gosport defences as part of the overall defence of Portsmouth Harbour. 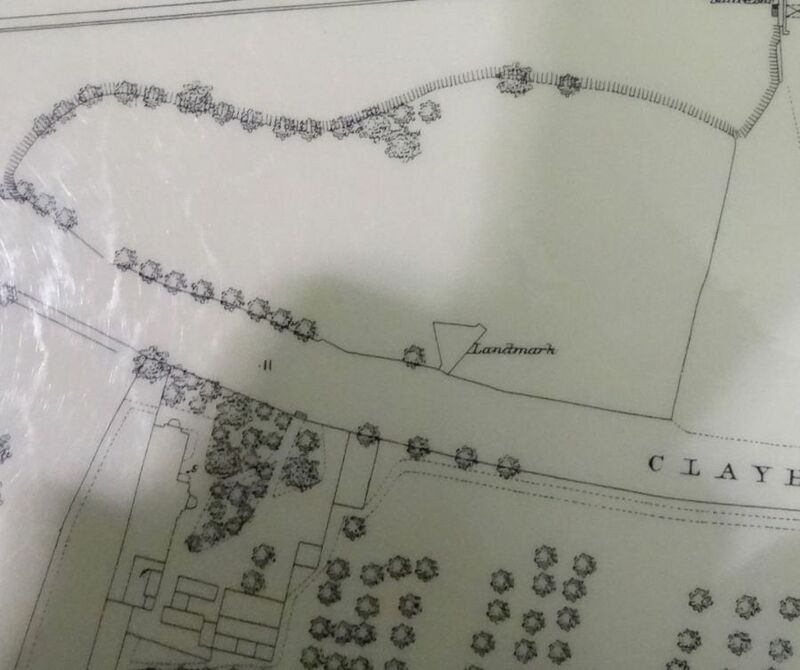 Archer reported that the mark at Gilkicker should be removed when an attack was imminent and a replacement in wood added so as to lure the enemy ships, using it as a guide, onto the shallows. The tower was removed in 1779 because it stood on the site for the new fort, but not replaced. Luckily Fort Monckton was visible enough from the Solent to be used in conjunction with the remaining sea mark to provide the required safe passage. Admiralty charts of 1898 show the Kickergill in use with a line bisecting Fort Monckton using the Measured Mile Marker erected on the Glacis in 1866 in place of the Gilkicker. 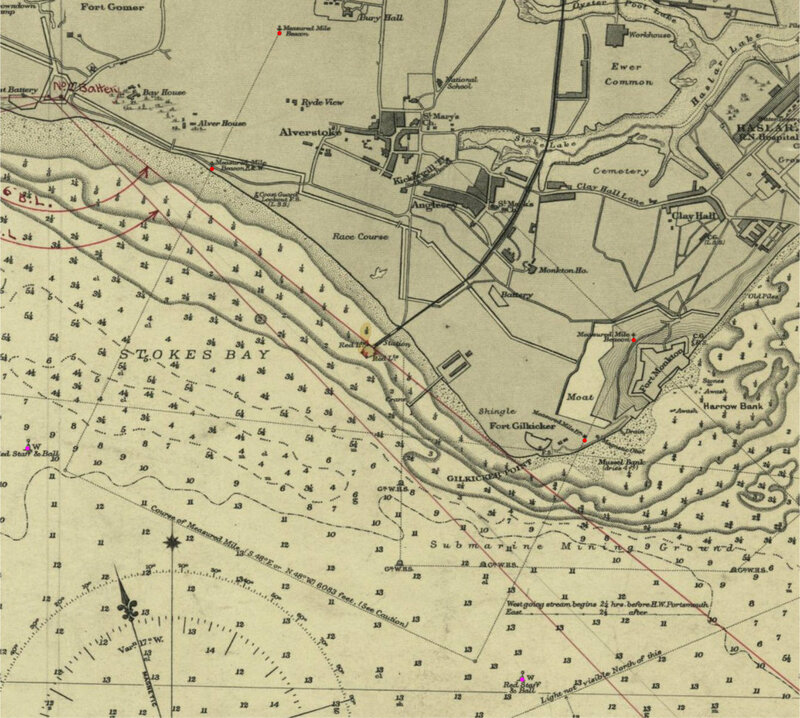 Admiralty chart dated 1898 showing how the measured mile marker at Fort Monckton was used together with the Kickergill as a navigation aid for ships enteriing the harbour. 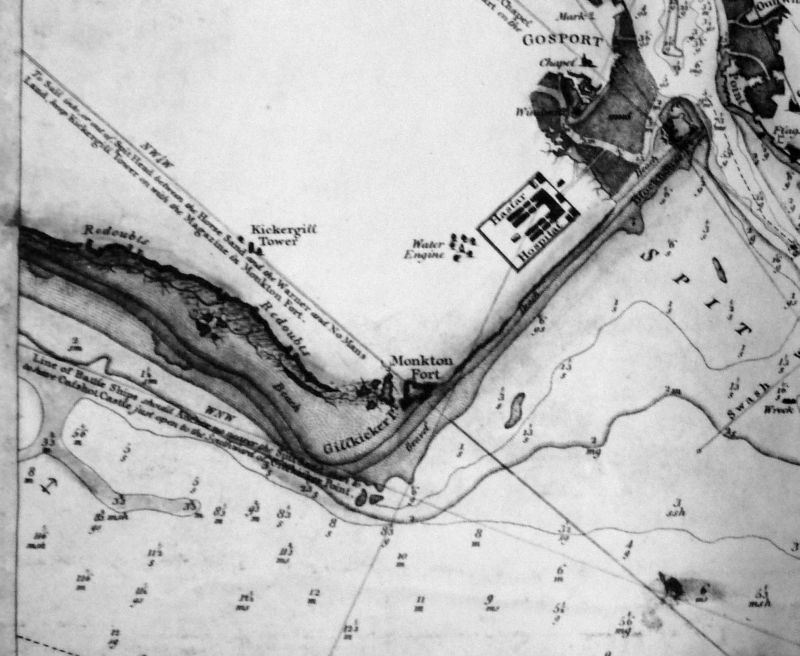 Kickergill in one with the Centre of Fort Monckton N.N.W. 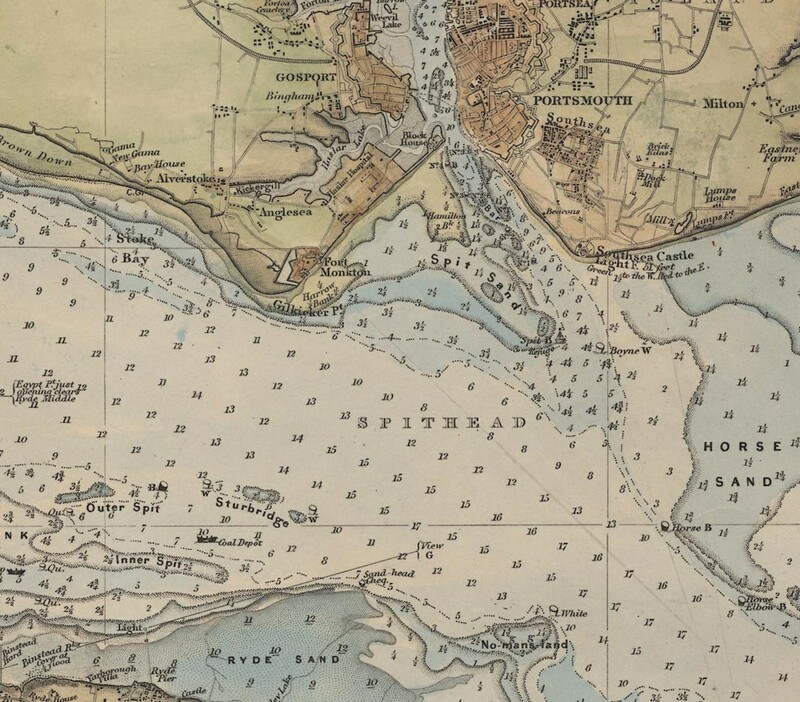 leads up to Spithead. 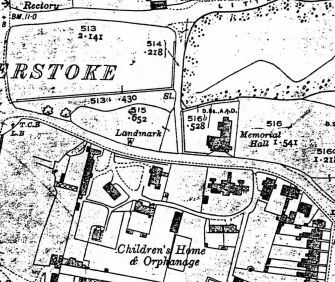 Map of 1932 showing the 'Landmark': By this time the Brodrick Memorial Hall and the Alverstoke National Children's home had been constructed. 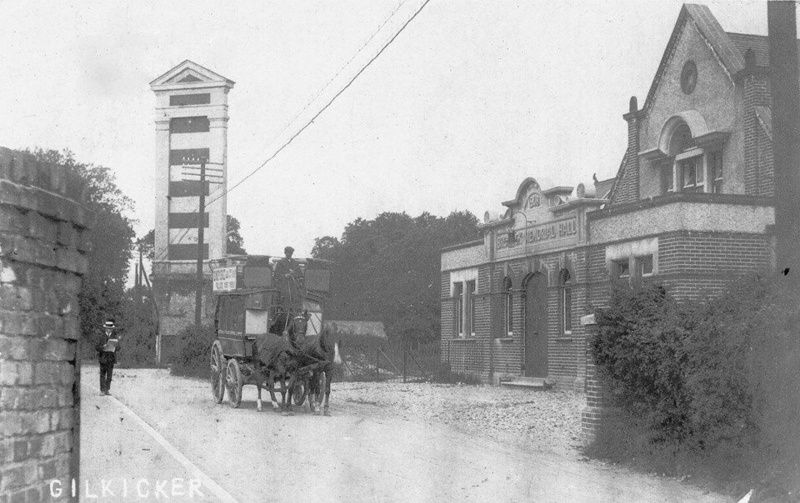 The Kicker-gill landmark on a postcard, wrongly labelled Gilkicker. A view of the Kickergill with the Brodrick Hall from across the lake. 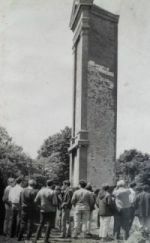 The site of Kickergill Beacon Tower transferred from Admiralty to GBC for demolition. 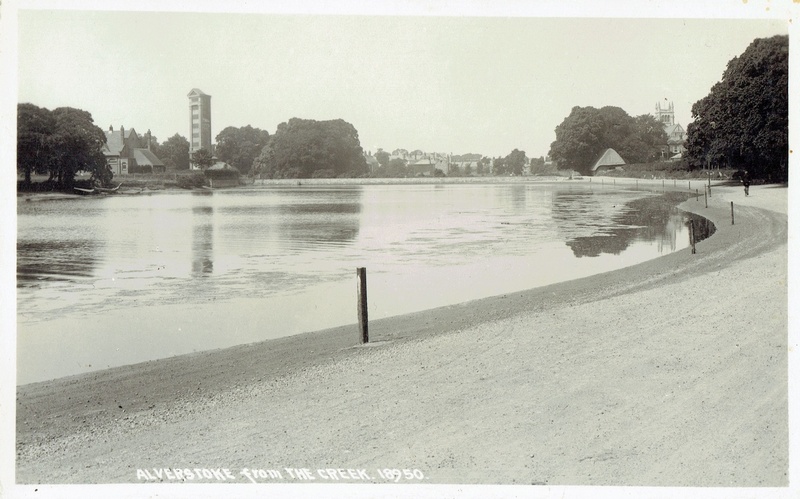 The Kicker-gill was demolished by Gosport Council on June 26 1965 'to make way for road widening'. 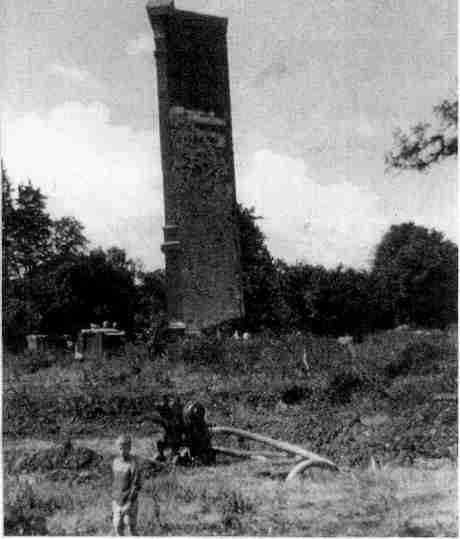 1937/01/27 Roads and Works Committee: Site of Kickergill Beacon Tower transferred from Admiralty to GBC for demolition. 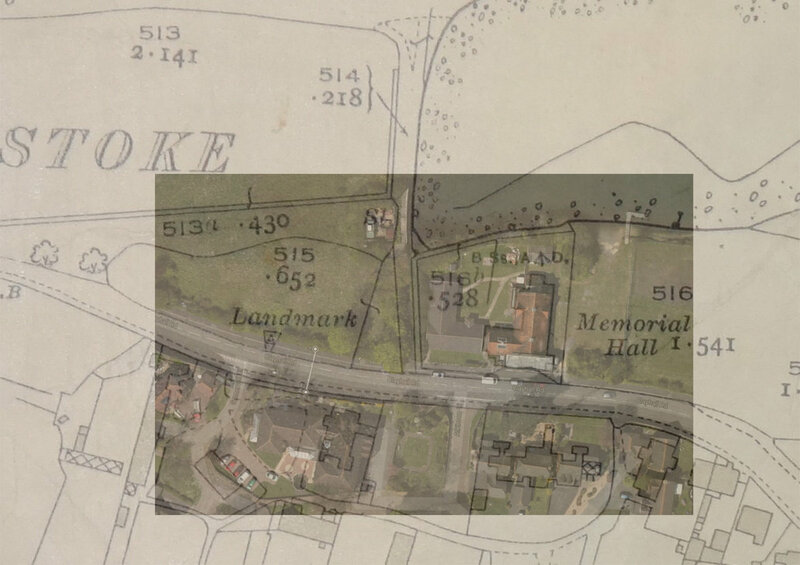 1965/03 Roads and Works Committee: p227 Demolition of Gilkicker Tower, Clayhall Road to allow road realignment due 1966-67; must be demolished before surveying etc can be done. 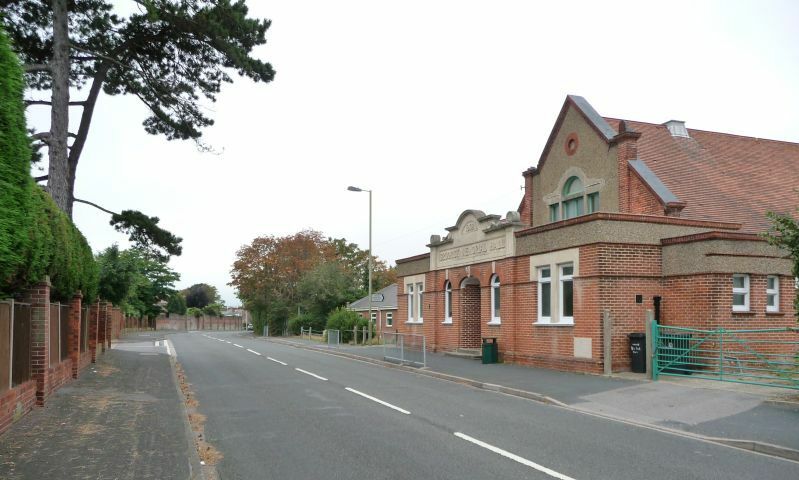 Next year a pumping station to be built to restore Children's Home land to a playing field. Tower will be felled onto this land; Ministry of Public Buildings and Works say the tower is not worth scheduling. 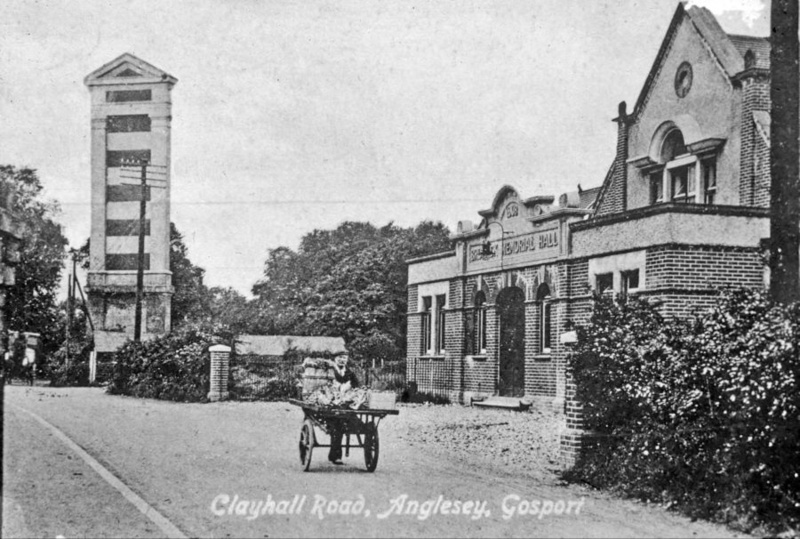 It was bought by GBC in 1938 and reprieved from demolition due to war. Ask specialists or Army to demolish. 1965/06 P&B p27 Minister of Housing & Local Government proposed additions to provisional list of Buildings of Architectural or Historic Merit: including Gilkicker (Kickergill) Tower. Tell them to remove from list as it to be demolished. 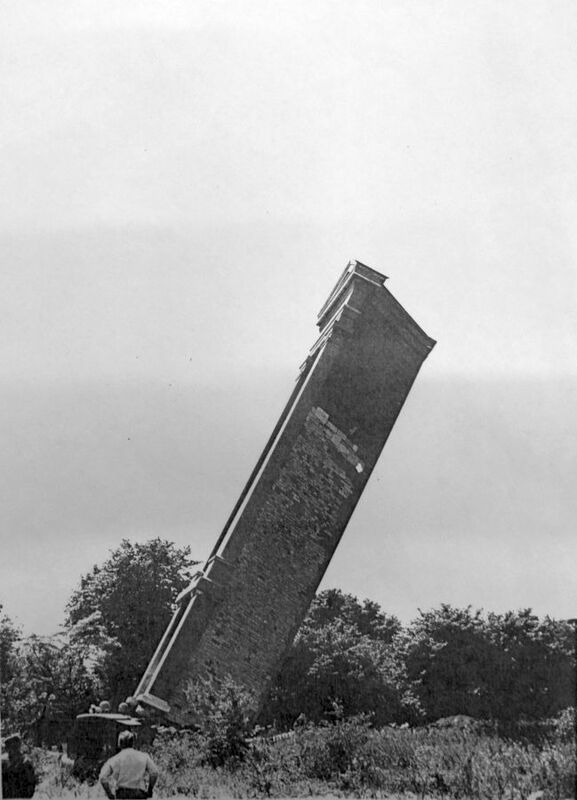 1965/09 GBC p127 contract with Bailey Bros to demolish Gilkicker Tower. 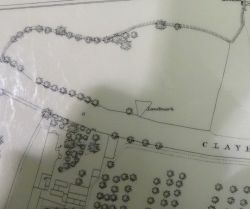 An overlay of the site of the Kickergill on a modern aerial view. 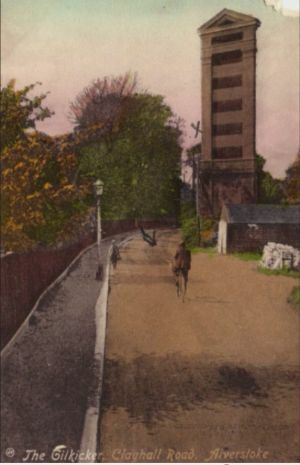 The pavement on the north side of the road now covers the site of the tower. Did this need to be done? The road with pavements at this point is now 13.86 metres wide. Could the pavement have been diverted around the tower leaving it in place?